(Brent Swancer) The ancient world is infused with all manner of mysteries that have perplexed us or faded into history, and among these were the myriad remarkable inventions and displays of knowledge often shown by various peoples of the past, ranging from great feats of engineering, to strange devices, to remarkably accurate maps of the stars, and more. Often inexplicable and baffling, these curiosities demonstrate that, far from being primitives, these ancients often had access to technology and skills far ahead of their times. But some incredible artifacts, structures, and sites discovered around the world seem to suggest that this knowledge may have passed even beyond that, to reach out into the world of science fiction and fantasy and hint at a possible ability to step through doorways in order to traverse time and space or to somehow move through dimensions or worlds. Here is a look at some of these anomalous portals and stargates of the ancients. Standing at Hayu Marca in Peru is a structure that consists of two apparent stone “archways,” with one measuring exactly 22 feet by 22 feet, and another smaller one measuring about 7 feet high, both carved into sheer rock. While the structure is mysterious and fascinating enough as it is, the legends and rumors that surround it are even more so. The ancient Incas believed that the larger of the two “doorways” was used by the gods to travel between worlds, whereas the smaller one was for mortals, and together they earned the name Puerta de Hayu Marca, or “The Gate of the Gods,” which could supposedly only be opened through a special ritual and a key shaped like a golden disc, called “The Key of the Gods of the Seven Rays,” which was said to have fallen from the sky long ago. This gateway was allegedly used to great effect in the 16th century, when Spanish explorers came through hunting for gold and other valuable treasure. According to the tale, one Incan priest named Amaru Maru decided that he was not going to let the gateway key fall into Spanish hands, so he retreated to the doorway, performed the required rites, and inserted the key to open it. There then supposedly appeared a brilliant tunnel of light, into which the priest disappeared off to the land of the gods, never to be seen again. When I saw the structure for the first time, I almost passed out. I have dreamed of such a construction repeatedly over the years, but in the dream the path to the door was paved with pink marble, and with pink marble statues lining either side of the path. In the dream, I also saw that the smaller door was open and there was a brilliant blue light coming from what looked like a shimmering tunnel. I have commented to my family many times about these dreams, and so when I finally gazed upon the doorway, it was like a revelation from God… How do you make order of such a strange occurrence? Interestingly, examination of the structure itself would show that there is indeed an alcove in the rock about just the right size and shape to hold a disc-like object. Additionally, there have been those who have claimed to have experienced strange sensations when near the gateway, such as anomalous noises, including music and whispers, as well as hallucinations of stars and “columns of fire,” and there are claims that a certain energy can be felt reverberating through the rock when touched. Was this ancient site really some sort of magical portal? If so who made it and why? It is unknown. Also in South America is the “Gate of the Sun,” located within the ancient ruins of the city of Tiahuanaco, in Bolivia, which was once the capital of a great empire stretching from Bolivia all the way into Peru and Chile. The city is steeped in ancient lore, with the original inhabitants believing that the Sun god, Viracocha, had chosen this location to create the human race, and it was said that he used this gate to travel from one dimension or world to the other. The gate itself is an arch hewn from a single massive block of stone, which has etched onto its surface various images of strange winged figures with curled up tails and wearing what appear to be helmets, as well as a carving of the sun god himself, complete with beams of light emanating from behind him as he dramatically wields two staves. The gateway has been said to have perhaps opened between worlds, but that it was damaged in some unspecified catastrophe, and sure enough when it was discovered by outsiders in the 1800s it was found to be toppled over onto its side with a large crack in the top right portion. It is unknown how this happened, but it certainly seems in keeping with the legend that it was destroyed and rendered inoperable in some event. Since the true purpose of the mysterious stone archway and the source of this damage is unknown, is it possible that it was once some sort of stargate? Interestingly, The Gate of the Sun is thought to lie along the same “grid line” as the gate in Hayu Marca, and the two undeniably resemble each other somewhat. Were the two connected somehow or even fashioned by the same mysterious, inscrutable builders? We will probably never know. In Sri Lanka there is a place nestled within the remote rocky wilderness and caves of Ranmasu Uyana, or “Gold Fish Park,” between the Thissa Wewa reservoir and the Isurumuniya Rock Temple, where there were found numerous strange symbols carved into stone on a grid measuring around 6 feet in diameter, and even more bizarrely four stone seats located directly in front of it. It has been speculated that the symbols represent some sort of code-key to open a gateway between worlds, or even an ancient star map of some sort, which is called the Sakwala Chakraya, or roughly “The rotating circle of the Universe,” more commonly referred to as “The Stargate of Sri Lanka.” There is very little known about the creators of this particular site or even exactly how old it is, leaving its ultimate role mysterious. Then the fifth angel sounded his trumpet, and I saw a star that had fallen from heaven to earth, and it was given the key to the pit of the abyss. The star opened the pit of the abyss, and smoke rose out of it like the smoke of a great furnace, and the sun and the air were darkened by the smoke from the pit. And out of the smoke, locusts descended on the earth. Vegh is convinced that this mention of the “Abyss” is referring to the stargate, which in this particular case seems to have led to someplace perhaps not very pleasant. Whether this passage is actually talking about portals or not, the idea of Sumerian stargates is somewhat supported by the occasional strange discoveries of depictions of Sumerian gods or kings using such devices, such as a seal with a god appearing on a stairway surrounded by what appears to be columns of water, and another that depicts the god Ninurta standing at a gateway ready to push a button while wearing what appears to be a modern wristwatch, of all things. Ancient Sumeria is often claimed to have had some of the most ancient of the supposed stargates, and were said to be portals used by entities from another world to travel between this planet and a mythical world called Niburu. It all sounds pretty far-fetched to be sure, but these ancient peoples certainly seemed to believe it. Is there anything to it at all? Considering its role as an important ancient civilization, it is perhaps no surprise that Egypt should have its own alleged stargates. Perhaps the most well-known of these is the site called Abu Ghurab, located at the Abu Sir Pyramids and just about a 20-minute drive from the Great Pyramid of Giza. Commonly called “The Crow’s Nest,” Abu Ghurab is thought to have been built by the 5th Dynasty pharaoh Niussere in around 2400 B.C. as a temple to worship the god Ra. The site itself has deteriorated considerably over the centuries, to the point that it is now practically mostly rubble, but it is believed that it once stood around 15 feet high and likely imitated the sun temple at On, or Heliopolis. One curiosity of the highly sacred site is a massive platform fashioned from alabaster, which is formed into in the shape of the Khemetian symbol Hotep, which stands for “peace.” Although the exact purpose of this platform has been lost to history, according to one theory by a researcher of ancient Egypt named Abd’El Hakim Awyan, it was used to harness and channel certain vibrations and earth energies, to convey a kind of harmonic resonance, in order to create an enhanced sense of enlightenment and awareness of the universe. This supposedly allowed one to attune themselves to the universe and to directly communicate with sacred spirits of the universe called the Neters, which were beings said to have on occasion actually visited Earth, possibly through Abu Ghurab itself, essentially making it a stargate. Unfortunately, we will probably never know if this was true or based on any sort of reality, or if it is all pure legend. A very bizarre alleged stargate of some sort is said to exist in the mountains of Southeastern Arizona. In 1956, treasure hunters Rob and Chuck Quinn came to the area on a mission to find gold and lost Spanish treasures, but would find something beyond their imagination instead. The two treasure hunters had already experienced quite a bit of bizarreness in the area in the form of mysterious floating lights at night, when they reportedly stumbled across a strange stone archway standing in the middle of nowhere, which measured 7 feet high and 5 feet wide and possessed columns of andesite 15 inches diameter. The archway was oddly standing amongst scattered and broken geodes, their contents glittering in the sunlight. As curious as this all was, they had treasure to find, so they simply made a note of the location and continued on their way. When they later mentioned the archway to others, a local Indian guide known only as “John” knew what it was, and had quite a few tales to tell about it. He claimed that on occasion people who had ventured through the archway had vanished into thin air, and that stones thrown through it would often not emerge from the other side, as if it were some kind of portal to, well, no one knows. John had also heard tales of the doorway glowing or shimmering, and he even had had his own very weird experience there. He told them that he had once been trekking through the area and noticed that even though that day had been dark and cloudy the sky through the stone archway had appeared clear and blue, a phenomenon which he could not explain. The Quinns decided to go back to the enigmatic site, and things would only get weirder from there. At first there was not much to see. They experimented with the archway by throwing rocks through it and even shoving their arms in, but nothing strange occurred at all and their skepticism of John’s fantastic tales grew. However, the following day as they rummaged about the site Roy and another team member witnessed the portal shimmering for several minutes like a heat mirage, and not long after this could feel a building pressure in their ears. This apparently lasted several minutes before dissipating. The effect could not be repeated, but a passing group of treasure hunters would tell them that the stone archway was indeed imbued with some sort of inexplicable force, claiming that as they had been camping there a rain of stones had pelted their camp from nowhere, and that the stones had been warm to the touch. It was an intriguing story, but nothing else strange happened at the site during their expedition, and they went away with more questions than answers. The Quinns would not forget the anomalous stone doorway, and in 1973 Chuck ventured out to the site once again. As he hiked up the canyon, he claims that when he stopped for a rest he noticed that there was another canyon that had not been there before. Thinking this to be rather odd, he climbed back down and entered the canyon from a different direction, where he realized that in fact he was in the same canyon he had been in before, only he had somehow been transported 250 yards down the canyon he had hiked along, and to another slope that was facing south rather than west. It was a very jolting experience that convinced him that he had travelled through some sort of portal and teleported from one place to another. It is all a very bizarre tale, and one wonders how much truth any of it has, or what became of this mysterious ancient gateway. Some tales are even more outlandish yet, such as is the case with an ancient Sumerian stargate that supposedly can be found in a massive ziggurat near Nasiriyah, a city about 370 km south-east of Baghdad, and which has sparked all manner of rumors and conspiracy theories. 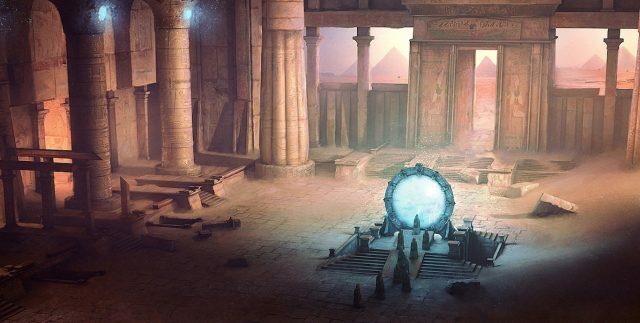 The stargate was allegedly discovered in the 1920s, and when word got out that it was there and actually worked many governments sent out expeditions to try and find it for their own purposes. Here is where conspiracy theories start to get fueled, with some claiming that the Anglo-Iraqi War of 1941 was started specifically as an excuse to gain control of the stargate. Of course Nazis come into play here, and they were said to have spent great resources and effort on finding the supposed stargate during World War II. Essentially more and more people are coming forward saying that they have been involved in these classified programs where these technologies are used quite regularly and that they are found all over the planet, Iraq is just one place they’re found. They are also located in places like Iran and Syria, which is why there is a push for America to go into Iran and intervene in the Syrian civil war. All this is very significant in what drives international conflict. It is all a fairly off-the-wall theory that has nevertheless gained momentum and popularity amongst some conspiracy theorists and has been much debated and discussed. Alas, it is totally unknown if such an object was ever really found at Nasiriyah, or if it is real what it really did. There is no evidence at all of any sort of stargate in some basement in Saddam Hussein’s palace, and it all remains pure conspiracy and speculation. However, it would make a pretty cool movie. Although it is impossible to know whether these ancient stargates worked or who built them, there have been theories. Perhaps the most popular is that these “gods” the ancients spoke of were in fact advanced extraterrestrials who used their technology to fashion these portals and travel through them. Another is that many of these sites seem to lie on convergences of ley lines, or natural veins of energy said to crisscross our planet, and that they somehow harnessed and exploit this energy to create some kind of wormhole or dimensional doorway. There is also the idea that at least some of these sites may have held a miniature black hole or some other vortex that could allow travel over space or even through time. There is no way to know, and it is of course likely that this is all just legend, myth, and speculation. It certainly is an alluring idea to think that among the many mysteries of the ancients they found a way to do what is typically firmly in the realm of science fiction; to travel across great distances in the blink of an eye through portals and stargates. If they were ever real where did these gateways take them? What wonders did they see when they stepped through? Perhaps just as curious is who or what stepped through from the other side? The answers remain buried in the mists of time, but it certainly does stoke the fires of the imagination. You can follow Brent on Twitter and Facebook.